This tutorial will be in two major stages. The first will be tethered control where a connected PC or Laptop with a USB cable will act as the serial controller. The second part will be using the HC06 mounted serial module (available on the shop or with the Deluxe kit) to control this remotely. The very final step is to be able to use an Android phone to control it. Warning - your robot will start to move with this - so you may want to make sure you are ready to field it from driving into or off something. The Explorer 1 robots - at least unmodified, can stand up on their rear - so the motors are not in contact with the floor. This is a good position to use while testing/developing. All the code - for each of the stages, and the final stage of this tutorial can be viewed at Github | dannystaple | orion-explorer-arrow-control. Please Download and unzip somewhere before starting. I will assume that you have already constructed the Explorer 1, have batteries, and have seen the motor control program working. First - start off with the 0_start app, which is the same as the basic app you’d used to test your robot. Now open up your Arduino app, and load this 0_start.ino file. You should have an IDE with two tabs. Leave the motor control tab alone for now, we can use that for reference for controlling the motor. The initial code here is the simplest setup - I’ll quickly take you through it to refresh before we get started on the next bit. This section first states that we will be using the MotorControl header in this file - that gives us the “Motor” class - a kind of code template for dealing with the motors. We create two motor objects with that class, passing in the pins the motor is connected to. For this arrow bot - those pins will stay the same and we shouldn’t need to rewire the motors. In this setup, we set both motors to move forward for 2 seconds (delay is in millis - 1000ths of a second), then turn the Right one back - which will cause the robot to drive to the right, for 1 second, we then set them forward for another 2 seconds and finally stop both motors. Finally there is an empty loop. The Arduino system requires this function to exist - even if you have nothing to put in it. We will find something to put in it throughout this tutorial. So before we start - lets show the basic idea: You will have a program on the controller that will read data from the serial connection (the USB cable in this case), and based on the data, drive forward, back, turn left, right or stop. To keep this simple - every key will start movement, and the space button will stop. Just in case things go wrong - so the robot doesn’t run away, it would be a good idea to have 1 second timeout on any movements. The keys will be sent from the computer - initially we will use the Arduino IDE serial monitor - but we will later find more interesting ways to control this. Check for a time out - stop the motors if no commands have been received for 2 seconds. What this will do is check if there is any serial data available. If there is, it will read the data off the port (you need this, otherwise data would always be available), then move the motors forward for 100 millis ( 10th of a second) and then stop. Save your sketch, and hit the Upload button to send it to your Arduino. Lets test this with the serial monitor built into the Arduino IDE - note that the serial monitor is a little basic, and will expect you to hit the send button for each keypress. You can access this serial monitor through the “Tools” menu.Type a single letter, press the send button, and the motors will briefly turn. You can see the code will do 100 millis for each key - if you send 5 keys, it should be roughly half a second. This is shown in the 1_basic_serial folder in the github download. Any keypress other than space will start it moving for 1 second, and space will stop it moving. We will need to monitor for keypresses inside the loop, while the robot is moving, so we can no longer simply use the delay. We will need some kind of countdown, which we can reset every time a key is pressed. We will also need to detect if the sequence sent is a space - and stop if that is the case too. How can we do the count down? There is a function in the arduino library called “millis” - which counts the number of milliseconds since the controller started or was last reset. You cannot set this value, but you can read it more than once. To have a timeout, we can take the following (common) approach - store a value of the timer plus a fixed interval - 1000 millis, and in our loop, check if the current time is greater than this - if so stop. First - we’ve declared a timeout variable, and initialised it to 0. If we have reached the timeout, the stop everything. If there is serial data, then read it. If the data is a space, then stop the motors, otherwise, move forward and reset the timeout. You should have code that looks like 2_start_stop in the downloaded folder. Upload this, and test with the serial monitor- you will need to reopen it as it closes during code uploads. A bit more design - we did say arrow keys, but lets use a common gaming convention and we can translate to arrows later. This is because they are a bit easier to test this way. W is forward, A left, S back and D right. It is usually the same shape as the arrow keys on most qwerty keyboards. We also need to keep that timeout, and the space to stop things. Note we must end each case with “break;” - if you fail to, the code will actually continue into the code for the next case too - this is known as fall through, something you don’t want to trigger accidentally (although there are legitimate reasons to trigger deliberately). You can add this at the top of the program, I normally do so after the include. Upload this, and if you have the tool “putty” - you can point it at the serial port for your robot, you will be able to drive it with the WASD keys and space to stop. You can see this code in the folder 3_arrows. Note in the last case, we fall through to a special case ‘default’ - which means that the stop command, and any other unrecognised command, will cause the robot to stop. Lets upload this - and you will have some control through the serial monitor. We’ll then build a small app to easily use arrow keys to send your commands to the robot. For using a PC to control the Arduino - I am going to use Processing - this a match well made with the Arduino IDE you have already been using as it has a very similar look and there is a lot of documentation on interfacing with Arduino compatible boards like the one on the Explorer. Please download and install processing. On Windows - please use only the 32 bit version as the serial library isn’t yet 64 bit windows compatible. Once again, a little basic design - we already have our tethered Arduino which received serial commands. The basic processing Sketch will need to do the following: setup a serial port When a key is pressed on the keyboard: if it is one of the arrow keys, send the right combination on the serial When the key is released: send the stop command on the serial port. So far - looks a lot like the Arduino IDE. We won’t need a loop function here as we will directly use keyboard events. Lets initialise a serial connection to our robot. In the bottom right corner of the Arduino window - there will be a note that says “Arduino Uno on …” - this shows the port you will need. This will be something like COMN, or /dev/ttyXXX. You now have the port to connect to. Your app will need to accept keypresses, and send them to the serial port. This can be done by adding a new function “keyPressed”. If you add this, processing will automatically call it every time a keyboard is pressed. You also need to know when a key is released, so you can tell the robot to stop. There is a keyReleased function for that. If you run this, when you hold down a key, your robot will move, and when you let go it will stop. You can now add a switch statement, just as we did above to map keypresses from the arrow keys, to commands we can send via serial. We can use a library variable named “keyCode” which holds the current keycode, and a number of library constants already defined for UP, DOWN, LEFT and RIGHT keys. If you now run this, you will be able to control the robot directly from the arrow keys on your keyboard, with it stopping as soon as a key is released! Awesome. This is in the folder under 4_pc_control. This whole thing is still tethered to your computer, and unless you have a very long USB cable, this is going to get quite annoying. So here is how to untether it. You will need a bluetooth module from the OrionRobots shop for the robot, and a computer with Bluetooth support or a bluetooth dongle. 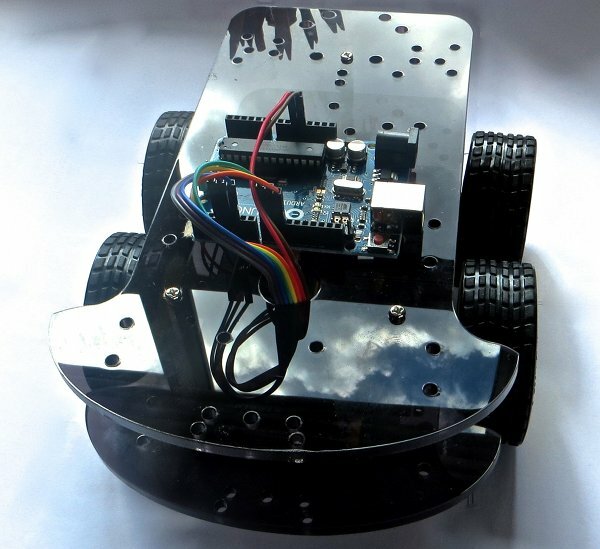 This module can bought on the Orionrobots shop - and once paired (the code is 1234) can be used as a simple serial port to talk with the robot- so you only need to change the port name at the top of your code, and this will work. To connect the module - take a look at the 4 pins - under them (on the reverse side) they have the labels TX, RX, GND and VCC. Peel 4 cables from the male-to-female cables included in the Orion Explorer kit, and plug the female end into the module. Plug the GND cable into a spare GND pin on the Uno board, plug VCC into IOREF. For transmission - the two lines TX and RX mean transmit and receive respectively. These lines need to be swapped - so Rx from the module goes to Tx on the robot, and Tx on the module goes to Rx on the robot. To stop the module dangling off the side of the robot, I’ve found it handy to poke it just a little into the upper cable port. Once you have this connected, you should be able to turn on your robot (without the USB cable connected), and see the bluetooth HC-06 module on your computer. Pair the module, and get the connection details (either COM<n> on windows, or /dev/tty< somestuff > on linux and mac), put those into the new Serial call. Restart your control app on the PC and you should be able to control the robot from the computer. I suggest tweaking the timeout on the robot code to 100 millis first. You will need to disconnect the rx/cx lines from the bluetooth module before using the USB cable to program it. If you have an Android phone or tablet with Bluetooth, you should be able to take control and drive the robot from it with the HC-06 module. First - download this free app - Bluetooth SPP tools Pro. Then, ensuring the robot is turned on with the module connected, launch the app and scan device - it should easily identify the HC-06, tap it, and pair with the code 1234. Enter “Keyboard mode” on the next page. You will see a bunch of buttons with the text clickMe on them. Open the app menu, and select “Buttons set”. In this mode, you will be able to program the buttons. click on the top-middle button and you’ll be able to change its name and the value it sends. Name it ‘forward’, and the send value to ‘w’. You can then click ok. Set the other buttons for left, back and right with the same ‘a’, ‘s’, ‘d’ values as above. When you’ve done all the buttons, summon the menu, and click “Buttons set complete”. This app will automatically send a line-ending after each value, so to disable this, from the menu select “set end flag” to “other”, and clear the value so it is empty. Click ok. Use the menu - and go to “set repeat freq”, set this value to 100 millis. Finally - change the trigger mode - to “Long press to send repeatedly”. You can now use the buttons on this app to drive your robot!